For expectant parents, and for parents or guardians of children from birth to age six. Read With Me is a free program for expectant parents and parents/guardians of children from birth to age six. Vermont Humanities trainers share the importance—and the joy!—of reading picture books with young children. 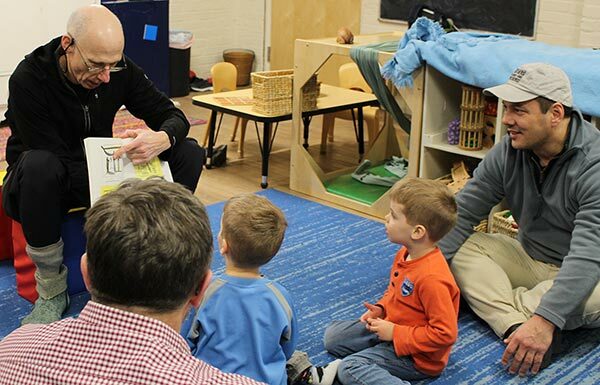 Parents and guardians learn how to make books come alive, and learn and practice animated readings, rhymes, and activities that encourage fun, language development, and communication. Free of charge! The Read With Me facilitator is provided by the Vermont Humanities Council. Free books. Each participating family will receive a set of nine beautiful children’s books. A training can be scheduled for two or three sessions. Ninety minutes per session. Designed for adults. Child care needs to be provided, but it can be funded by the Humanities Council. A minimum of eight parent participants. A host/staff person from your organization is expected to participate in the group. Advertising is crucial to recruitment so we will send you a flyer a few weeks in advance. We do the rest! We offer three different themes, each with many wonderful, classic children’s books to choose from. Contact Ali Palmer, Director of Literacy Programs, at (802) 262-1352.